Admit it, you’ve driven past a new charter school or public library or professional building and wondered where it came from seemingly overnight. Or you’ve questioned the necessity for so many workers at a construction site when only a few of the hard hats are visibly in action. Or you’ve pondered if a road construction project—paid for with taxpayer dollars—would ever be completed. 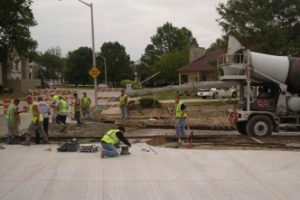 These are all common stereotypes or misnomers about construction projects, whether they’re for road improvements, new developments or expansion endeavors. To the layman observer, it can look like mass chaos or a prime example of wasting time and money at public expense. “Even my wife has told me, ‘It doesn’t look like anyone is doing anything,’” jokes Scott Cherry, senior vice president for The Skillman Corporation, who’s been in the construction industry for 33 years. Cherry is a member of his firm’s Indianapolis-based management team, working out of its Merrillville office. “We understand the stereotypes and the jokes, but there are typically months of planning and designing before any project begins. It’s all very detailed,” says Cherry, whose niche is public works projects such as police stations, schools and libraries. Behind the scenes, there is much more getting done than what initially meets the eye from the casual observer or the drive-by critic, according to on-site engineers. 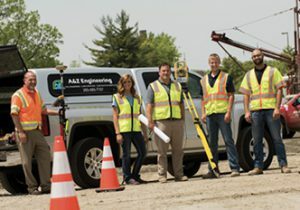 A&Z Engineering, LLC is currently working on a roadway project involving right-of-way issues with 122 different property owners. “And each one has to be resurveyed and re-platted” says Mark Voss, senior construction manager. His firm’s marketing tagline is “Your Engineering Solutions… Start to Finish,” but there are even some clients who don’t understand every step along the way, literally, from start to finish. The initial spark for any project is always an idea, ignited by a need. Is a new school needed? Does a strip mall need to be expanded? Is an old police station falling apart? Is a high-rise development needed to enhance a gentrification movement? A Request for Qualification, or RFQ, and a Request for Proposal, or RFP, in addition to the proposal selection and approval of a consultant firm. The scope of work and services, as well as the fee submission. A geotechnical analysis of soils in the area. A preliminary survey and preliminary estimating. Finalization of the study with proposed options for design and construction. And identifying sources of funds, possibly including local, state and federal tax dollars. “This only scratches the surface for this type of project,” says Mark Voss, senior construction manager for A&Z Engineering. Such projects must be repeatedly reviewed by multiple governmental entities at the state level, and additional departments get involved if federal funding is used. “This is why some road projects take from five to 10 years to fully complete,” Voss says. Not to mention other common challenges, such as addressing right-of-way issues. “For instance, going through a graveyard or a historic home district,” Voss says. His firm is currently working on a roadway project involving right-of-way issues with 122 different property owners. “And each one has to be resurveyed and re-platted, and everyone thinks their home is worth more than it actually is,” Voss says. Similar challenges face new construction projects where much of the work must be performed long before any shiny shovels dig into the ground or any ceremonial ribbons are scissored to obligatory applause. “Work begins between the client and the architect typically months prior to clearing the site for preparation of the building’s foundation,” says Cleon Stutler, owner of Stutler Architects in Portage. Preliminary work includes research and design, determination of location, lot size, type of building, and property line setbacks. “This is the first step to determine the max allowable square footage,” Stutler says. Next, a preliminary floor plan is developed to determine a budget and square footage, based on the type of building, specific client requests, and many other factors. Simultaneously, while these meetings are occurring, the architect is arranging meetings with city officials, utility company and surveyors. “For a project to be approved for construction, the first step is obtaining city approval,” Stutler says. The architect meets with city officials during the preliminary stage to determine what requirements or standards will be enforced, and any specific concerns regarding the proposed project. For example, if city officials have reasons to deny a proposed project, it would be a significant waste of time and money to complete construction documents and obtain state approval if the project is not approved by the city. “It is crucial to find out concerns and input from the city planning department prior to the bulk of work being done,” Miller says. On a work site, there will typically be existing utilities and how to navigate them, such as a sewage line coming into the property on the south side, prompting the plumbing to be designed to connect on the south side, not the north side, of the building. Similar correspondence is essential between the architect and the surveyor. Are soil tests needed to determine if the site contains proper substrate to build on? If not, it could be extremely costly, depending on the severity of the situation. “The client may decide to not move ahead with the project,” Stutler says. Cherry outlined three major phases for most construction projects: design and planning; bidding process for contractors; and the actual construction. By the time the public sees any work being done, a large portion of the project is already completed. “For an architect, 80 percent of their job is done, but for me, only 20 percent is done,” Cherry says. Several other factors come into play: public safety, workplace logistics, construction scheduling, budget shortfalls, hired contractors and, of course, a client’s final satisfaction. Sometimes the client is a private developer, other times the client is a school superintendent, board of directors or a local official. The bidding process involves separate categories for carpentry, masonry, mechanical, electrical, plumbing, drywall, and so on. The Skillman Corp. was behind development of the Crown Point Public Library, as well as the ongoing $165 million construction project for Valparaiso Community Schools, including the extensive $75 million renovation and expansion of Valparaiso High School. Cherry first got involved in the Valparaiso Community Schools project in November, 2015, with designing its first budget. This came after a public referendum approved the hefty expense. The referendum process alone can take several months, first to address a need for improvements, then analyzing its cost and work-site scheduling. “For these types of projects, approval from the public is needed before any construction can begin,” Cherry says. Roger Stephens, director of business development and marketing for RQAW Corp., says public input is a crucial factor that too many people are unaware about regarding public works projects. “There are certain procedures we have to legally follow, including a public input period,” says Stephens, whose engineering-architectural firm is based in Indianapolis, with an office in La Porte. “A needs assessment and analysis can take several months. Not to mention attending municipal planning and zoning commissions, and acquiring the needed permits or approvals,” says Stephens, who had just returned from a public meeting for a bond resolution towards a public works project. “That process alone will take typically from six months to a year, and even longer for private developments,” Stephens says. RQAW creates innovative, functional solutions for several industries, including municipal, public safety, educational, military and industrial. But the firm specializes in correctional facilities and public safety buildings by providing construction contract oversight and project inspection, while also monitoring construction budgets and schedules. Its tagline is “Intentional innovation,” and this mission is needed as Indiana’s correctional facilities continue to expand, partly due to the boom of its female prisoner population, a result of the state’s ongoing opioid crisis, Stephens says. “Once again, a public need typically drives new construction,” he says. A similar need prompted the Valparaiso schools expansion project, with completion expected by the end of 2018, except for a $17 million natatorium (a building containing a swimming pool) to be completed in 2019. 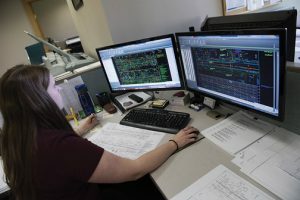 The massive renovation project is broken down into three phases: schematic design; 50-percent design; and completed design, to make sure it fits into the approved budget. “Even an extra 2,000 square feet of construction work can add a lot of unexpected funding for a project,” says Cherry, whose staff is on site every day for every construction project. Click to read more from the Feb-Mar 2018 issue of Northwest Indiana Business Magzine. Jerry Davich has written about the last days of a woman with terminal cancer, flying in a U.S. Thunderbirds fighter jet at 9.2 G’s, witnessing a forensic autopsy, and skydiving out of a plane with a tape recorder in hand. But his passion is for good old-fashioned storytelling through his Chicago Tribune newspaper column, which has garnered him more than 51 state and national awards. He also writes freelance stories, hosts the “Casual Fridays” radio show on Lakeshore Public Media, and serves as a public speaker with presentations on timely issues and three books Crooked Politics in Northwest Indiana, Lost Gary, Indiana and Connections: Everyone Happens for a Reason. Jerry lives in Portage, cruises the Northwest Indiana region on a regular basis, and he never leaves home without his pen, notebook, and curiosity. this s Jamal Anabtawi, and just wanted you to know, I did enjoy reading your article. I liked how you gather information from several sources and merge them into an article. well done!